By Yuri Grin on April 29, 2018 in Blog, How to start online business?, Motivation and personal growth. Warren Buffett explains how you could’ve turned $114 into $400,000 with a simple long-term investment. Many of us know the magic of investing money in the stock market—just letting it sit and watching it grow—but few of us really grasp just how powerfully enriching this can be. Not surprisingly, Warren Buffett, the world’s greatest investor, has a vivid example of this which he shared with me during a visit earlier this year at Berkshire Hathaway headquarters in Omaha. First, take yourself back, way back to America’s entry into World War II. Franklin Roosevelt was president and Buffett was a young boy. And as you may know young Buffett, unlike most kids his age interested in games or sports, was basically consumed by the stock market. And at that dark moment in US history, Buffett was ready to take action. “Let me give you a figure that’ll blow your mind I think. I bought my first stock when I was 11 years old. It was the first quarter of 1942, shortly after Pearl Harbor,” Buffett recalls. “I spent $114.75, [for] shares [of a stock.] $114.75. If I put that $114 into the S&P 500 at that time and reinvested the dividends, think of a figure as to what it…would be worth today,” he asked me? I’ll give you some help. That’s way low. Buffett acknowledges that it’s not always easy to stick with it all the way through. By that last point Buffett means those big management or brokerage fees would eat up your returns in a huge way and you’d end up with far less that $400K. So here’s a big question: Will it happen again? In other words, if you invested a similar sum and held it for the same 76 years or so, would you still make out—maybe not exactly the same of course—but would you still make out like a bandit? Buffett answers that if not directly, then directionally. You pick up these kinds of things from investing for almost eight decades. Watch Warren Buffett LIVE at the 2018 Berkshire Hathaway Annual Shareholders Meeting exclusively on the Yahoo Finance app and desktop. Coverage begins May 5 at 9:45am ET. Warren Buffet strategy is good for young people who have enough time to invest. Do we have a plan for average people who want to make extra income online without long-term perspective? Check this out (press image below or right side if this blog). This is the moment in the Matrix when Morpheus offers Neo to take the red pill or the blue pill. For Neo, one pill leads to mediocrity and the other leads down the rabbit hole of the unknown. Only proven methods and principles will make you profits. You can START a profitable business working one hour a day, but to grow that business will take more than an hour! You must master at least one form of PAID traffic to succeed online. The only way to truly succeed online is by selling high-priced, high-commission products or you’re doomed to an Amazonian takeover! Someone in your organization must know how to sell and sell very well. At many online companies like SAN, DA, SFI, MOBE people have tossed out the blue pill. The blue pill may make you FEEL better in the short term…but we live in the REAL world. MTTB is a 21-step system based on proven principles (so proven they’re backed with a ten-times your money back guarantee). You can start MTTB working less than an hour a day, but as you start making $1250, $3300 and $5500 commissions, you’ll have to work more…but don’t worry, you’ll WANT to work more. MTTB preaches the value of BUYING good traffic. Free traffic does not work. At least not for long. (Ask the folks on Facebook who built up their “likes” only to have Facebook pull the plug on them and say, “If you want your likers to see your posts, you’ll have to pay us.”) Period. Sorry to break it to you. Find a traffic source you can BUY and turn into sales and they can’t take it away from you. MTTB sells high-priced products. It’s the only way we can pay out such high commissions. It’s the only way you can make big money without signing up 150 of your friends and family in a “downline”. With MTTB YOU don’t have to sell, but our phone sales team will sell for you. And they know how to close! No company ever succeeded without GOOD sales people. We provide them for you! Do we have another alternative to make online business with legitimate companies but not to have to buy from the start high priced products, courses, training? Yes, see the plan below. Okay, Neo, what’s it gonna be? Red pill or blue pill? By Yuri Grin on April 25, 2018 in Blog, Books and Reports, Motivation and personal growth. You Absolutely Must Ask Before Choosing a Home-Based Business. I know you’ll find it useful because, unlike a lot of guides and how-tos and checklists that you can find on the internet, my eBook is really more of a story. In the eBook, you’ll see the mistakes I made along the way. You’ll read about the hard lessons I learned on my journey toward building a 40 million dollar company. How I learned, from experience, what questions I wish I had asked. Had I known then what I know now, it would have saved me a ton of hassle, heartache, and, of course, money. I encourage you to read the eBook right away and ask yourself those 10 questions before starting any business. Is 15 min of your time worth $300? Even if this fantasy were possible (which it’s not anymore), it assumes that you’re Ok with working most of your life for a retirement fund that may be taken away at any time. Seems like a waste of a life to me. I’d rather enjoy my life now… make money now… and have the time and freedom to work when and where I want, and travel at a moment’s notice. If you don’t believe this is possible, then my ebook WiFi Millionaire will prove you wrong. Retirement and pension funds are disappearing. Jobs are being lost (or replaced) at record rates. And regular people all over the world are feeling the pinch. In fact, if you’re willing to rethink everything you know about “work” then you can take advantage of this New Economy and make more money than you ever dreamed possible. … and becoming a WiFi Millionaire with just a computer, a WiFi (internet) connection, and a desire to succeed. Now, this may sound far-fetched to you. Despite what you may believe, want, or even hope, making a living online will be one of the most challenging things you ever do. Friends who mean well will tell you to quit… your work colleagues will laugh at you… and some ‘haters’ may even try to actively stop you from succeeding. Because your own mind will even plot against you. Of course that’s untrue. Your mind is a liar. A very convincing liar, but a liar nonetheless. And that’s why when anyone asks me what they need to do to start a six-figure income online I tell them the same thing. It may seem esoteric or weird, but the fact is, without the belief that you can improve your life and financial situation, you never will. But when you ‘turn the corner’ and start believing in your ability to make five, six, or even seven-figures commissions, the sky’s the limit. You may be thinking, that sounds great – in theory – but I tend to get down on myself, how can I make a practical change in my mindset? I totally understand. I wasn’t always a positive person and I didn’t always make a great living online. So today I’d like to share with you three simple tips you can use today to unlock your ‘millionaire’ mind. Positivity is infectious. So, read more positive books, watch more positive shows, and most importantly, surround yourself with positive people. Jim Rohn famously said you are the average of the five people you spend the most time with. So, if you want to earn six or seven figures a year, spend time with people who are also successful in business. Reducing negative self-talk starts with awareness. Think about it. How can you stop the negative thoughts that limit your success if you’re not even aware you’re thinking them? So, start writing them down. It seems counterintuitive, but by noting your negative self-talk you’ll actually reduce it over time. You’ll never be successful if you’re constantly changing the goals posts. You can’t have the goal of making money online one day and then wake up the next excited about the idea of opening a waffle shop. Switching goals doesn’t make any sense and you’ll just end up spinning your wheels. If you want a free life where you make thousands a day, commit to it. Find a system that works and put your all into it. This is a new guide just released by a $150m earner from Australia, and it outlines the fastest way for you to start and grow a successful online business from home. I highly recommend you grab a copy now. Home-based business with Amazon. How to start? By Yuri Grin on April 25, 2018 in Blog, How to start online business? Amazon, the US e-commerce and cloud computing giant. Find the perfect product to sell! Well, with a new piece of software called Profit Spotlight, you can harness the power of years of experience combined with huge data from Amazon, and pick the perfect product for you to sell. Oh, and the software is FREE! P.S. You need to hurry up though, because the access to this free software won’t be available for long. Go get the software ASAP while you still can. And that’s not all! In addition to this tool, you’ll get two other bonuses: a list of countries allowed by Amazon (so you don’t waste your time) and a list of recommended profitable categories that are currently KILLING IT with sales. CEOs’ salaries have ballooned alarmingly over the past 50 years. Last week, when Amazon shared the news that its blockbuster subscription service, Amazon Prime, hit a milestone of more than 100 million members, the e-commerce giant also revealed another astounding number: The average annual salary of an Amazon employee is $28,446. This income, critics were quick to note, is in stark contrast to that of Amazon CEO Jeff Bezos. 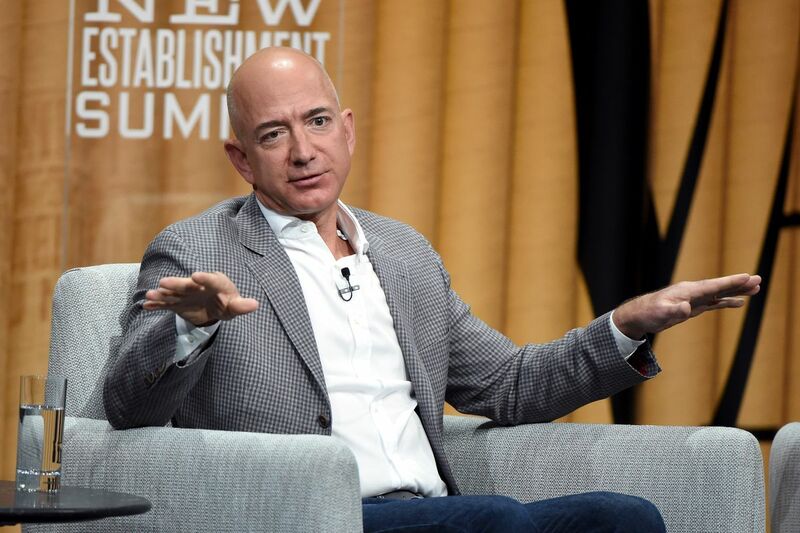 According to its annual proxy filing, Bezos’s compensation last year was $1.6 billion, and the data firm Equilar found that he makes 140 times more than his average employee. Per Bloomberg’s Billionaires Index List, his net worth grew by $35 billion in 2017 alone, and the tech executive now has a net worth of $127 billion. So how can Bezos, the world’s richest person, amass such wealth while plenty of his employees are reportedly living on food stamps? The same way Walmart CEO Doug McMillon earns an annual $22.8 million while the average Walmart worker makes $19,177, as the company’s security filing revealed on Friday. Amazon and Walmart join a long list of American companies with huge pay gaps. And we’re finally getting the full picture, thanks to a new rule the US Securities and Exchange Commission is enforcing, in which publicly traded companies now have to reveal the pay of their CEOs as well as the average income of employees in their regulatory filings. The mandate is part of the 2010 Dodd–Frank Wall Street Reform and Consumer Protection Act, a reaction to the 2008 recession, in which investment banks, insurance companies, and mortgage companies either collapsed entirely or relied on federal support to keep running. Dubbed “salary shaming” by the Washington Post, the ratios coming out of this new legislation illustrate just how dramatically CEOs have been able to prosper as their employees continue to earn low wages. By Yuri Grin on April 23, 2018 in Blog, Motivation and personal growth. Nowadays, the belief that your only limit is you is an actual fact. Each day, ever more evidence comes to confirm this point as an inevitability. You should be aware that your mind is everything and controls every aspect of your life. It has even a significant influence over your body. By knowing that your only limit is you, you can use your determination to take action and do so. You have to prepare and get ready to get to the top by looking at the summit and not to the bottom. You have to be inspired and keep striving to be the best you can be. So, I wish you great success! How is it possible? Why is your mind creating limits? How can you get past those boundaries? To begin with, your body hears all things your mind thinks or says. So, if your mind, for example, can talk your body into feeling right or wrong, what else can it do and what power does it have? Have you ever paid attention to the way you speak to yourself? What does it look like? The difference is how you look at the glass, is it half empty or half full? You see, when you think about it, your only limit is you. Perhaps you have never actually considered this small distinction as necessary before. However, it can make an enormous divergence in what you achieve in life. Only because when you believe that you cannot, you put a limit on your potential. The fact is that when you let your thoughts wander, and your mind consider that there are limits, you start to get doubts. Therefore, you think your glass is half empty, and you tell yourself that you cannot. Then, of course, what unfolds is that you begin to believe that you cannot indeed. To get rid of any limit, you have to establish in your mind that what you desire is stronger than anything else you want. Then, you have to burn the bridges behind you and say once and for all that this is it. That way, you have no retreat and no choice but to continue all the way to achievement. To go for what you want is not so hard if you are determined, but to stay motivated is what is challenging. It is quite easy to dream big when your dreams are just in your head. The only limit comes when you have to do the tough things such as the everyday grind, the perspiration, and the hard work. Believing in yourself is the best thing you can have as it tears down any doubt you might have. It is hard to get over doubts even you do not believe in yourself, and it cripples you. Disbelief, uncertainty, and doubt are things that make everything else seem impossible. So when you realize that your only limit is you, you find a way to believe in yourself again and therefore, nothing can stop you anymore. There is no escape; everybody has a hard road. But your mind is everything. If you do not believe you can do something, then you cannot. You have to fight to get greatness. It is like having to save your own life. Nobody is going to do it or save it for you. You got to give everything you have to get where you want to be. Dwelling and crying won’t help a bit. If you quit, you are going to lose. When you have a resolution, and I am not talking about a New Year resolution, but a real one, something to accomplish, you have the resolve, and you know that it is going to happen. help and teach people how to get a fresh start and have a brand-new style of living after a divorce, loss or if single. Do this by using self-development techniques to help you grow, succeed and have a better life. Remember, it’s not just about growing but also about ending the routine. It’s about the lifestyle of working less, living more and enjoying life! … Discover how you can afford to stay home and change your actual living by using internet resources, business opportunities that legitimate companies have to offer – click banner below to see one that might be the one that fits your interests. By Yuri Grin on April 23, 2018 in Blog, How to start online business?, Motivation and personal growth. Thankfully, we didn’t give up and through perseverance, we were able to achieve the success that had eluded us for years. Along the way, we discovered many things that we wish we had known when we started this journey. For some reason, people think that they should become rich in a few months with their new home business and some people believe success should happen within weeks or days! We introduced a man in his early 50’s to our business and he was excited. When we first met he complained that he had been working hard for more than 30 years and he was broke. We were frustrated so many times in the first year of our home business that quitting seemed like the sensible thing to do. After all, these things don’t work. Who do you think you are? Why don’t you just get a job like everybody else? These thoughts and many, like them nearly kept us from success. If you already have a home business, perhaps you are facing the same thoughts. Don’t let the negative thoughts crowd out the life-changing success that a home business offers. Sure, we struggled at first, but after 20 months we were making $100,000 a year in lifetime residual income! When you find yourself facing bankruptcy and foreclosure as we were and then apply for food stamps you have a firm grasp on the tough times life can bring. Most people who start a home business quit in their first 90 days and go back to their dreadful lives of desperation. Most people aren’t really living. They are only existing. They’re going from one day to the next without any hope of a better life. Since most people who start a home business have never owned a business, we must learn to be disciplined, if we’re going to operate a successful home business. There were times when somebody told us no and that was devastating. We’d usually mope around and fail to do anything else the rest of the day. Had we maintained that attitude, we’d have a job right now instead of a successful home business! It’s also a good idea to have a permanent workspace, so you can shut the door, eliminate distractions and get your work done. This is a difficult adjustment for some people to make, but your children can learn that when Mommy or Daddy is in this room with the door shut that they are working. You’d be amazed at how many children will respect your space and time if you ask them too. We’ve seen many successful, stay at home moms and dads work with children nearby. Don’t let screaming children or children that interrupt you on occasion become a big deal, the person on the other end of the phone may be convinced that your business is right for them BECAUSE they hear your children in the background. One of the reasons I failed in other home businesses is that I didn’t understand the importance of finding the right person to work with. I am not blaming my failures on somebody else, but if I had been associated with people who really knew what they were doing they would have given me guidance that I did not get. Perhaps I would have failed anyway, but there is no doubt that working with successful people will cut your learning curve and save you a lot of time and money. Only you can assure your success, but finding the right person to work with and then listening to that person gives you a tremendous advantage over most people working a business from their homes! Last week I received an email from a so-called marketing guru offering his services. I could get his marketing expertise if I paid him almost $800. Almost everything he offered we give to our team members for FREE! We know that what we’re doing works for our business because it has been tested and proven to be successful or we wouldn’t do it. His material, although similar to ours, hasn’t been tested in our business and could prove to be a waste of both time and money. What would happen if you sent that $800 and it didn’t work? How supportive would your spouse be then? Many years ago you had to get out and meet people and most businesses was, done face to face. You could call people around the country, but if they had any interest in your business you had to send a package overnight. That proved to be very expensive. Then, the internet changed everything. You don’t have to meet people face to face anymore, although I must admit it’s still my favorite way of doing business. Today, you can upload a video in seconds, so people can see you. You can send an email with links to websites, videos, and your contact information. Autoresponders make you look like a Fortune 500 company, and nobody knows how big your business really is because anybody anywhere can have a great looking website. When I started my business more than 10 years ago my long distance phone bill was nearly $1,000 a month, today we can call as much as we want for $20! You can use conference calling and webcasts to present your business to hundreds of people at a time. People can automatically receive your latest Podcast and watch it on the subway or at lunch. This is the information age and you should capitalize on the shift in technology in your home business. Don’t worry about all the latest gadgets when you start your business because the personal touch will always be important. Even if you don’t have a lot of money technology allows your home business to operate and look like a very big business. Once you understand the basic fundamentals of your new home business and once you’ve achieved some success, you’ll understand that the sky is the limit. We make much more money than we ever thought possible and we have friends that are making more than $1,000,000 a year! Hard to believe? Of course, it is! Just because it’s hard to believe doesn’t mean that it isn’t happening. After we struggled with so many other businesses I wanted to believe that we could become incredibly successful, but my past was holding me back. Today, we operate a home business that generates almost $10,000,000 in annual sales! Years ago I never knew anybody that made $1,000,000 a year, so it was hard for me to “see” myself ever reaching that milestone. When a good friend of mine did it, I could then start to see that I could have that kind of success. We didn’t listen to people who laughed at us and yes, there really were people who laughed at us. We believed that we would have life-changing success even before there were any real signs of success. Some people call that the “fake it till you make it” concept. While we wholeheartedly endorse that concept we do not recommend that you mislead people. There’s work to be done employ leverage, getting paid for other people’s efforts, you can enjoy the fruits of your labor so much more. the efforts of thousands of people. the leverage concept. It’s the only way you can have money and the time to enjoy it. The wealthiest people in America became wealthy by owning businesses. the breakthrough improving our skills and our confidence and that’s when success started to happen. We recommend that you work your home business a minimum of 7 to 10 hours a week, and do it consistently for at least two years. Are you committed to improving your skills and working on you? Read at least 10 pages from a great book every day. Books like “Think and Grow Rich” will change the way you think and when you change the way you think you will change your life. Are you going from one safelist to another cutting and pasting your ads? If you’ve answered yes to any of these questions then the Solution has found YOU!